You'll want to look at pictures of different designs for square wedding cakes before deciding on the one for your big day celebration. From smooth to elaborately decorated, tiered or offset in a spiral, square wedding cakes offer additional surface area and style. One of the advantages of a square wedding cake is the additional space in the corners, along with the extended sides. Make the most of this by not only decorating the sides, but placing accents on the corners, such as these orchids. Placing something on top of each corner is not the only way to accent and show off the corners on a square cake. Elaborate icing scrolls and flowers piped solely onto the corners adds subtle, elegant emphasis. Square cakes have long, flat sides that make them ideal for handling unusual decorations. This square cake uses rose petals scattered over the sides of the cake with just an icing border. The simplicity of the petals complements the clean lines of the smooth cake layers. This unique cake alternates cake layers covered in smooth chocolate fondant with layers completely obscured by tightly packed roses. The square cake layers help make this contrast more pronounced because the chocolate layers look like platforms for the rose layers. Square cakes do not have to have tight, chiseled corners. Slightly rounding the corners of a square cake will result in a gentle, pillow-like effect. Tying a ribbon around the base of each layer further helps to enhance the pillow look. All wedding cakes can make use of negative space between the layers with tiers, and square cakes are no exception. 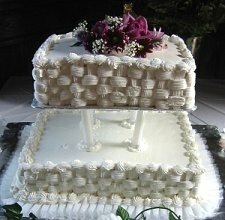 The effect on a square cake is actually greater than the same effect on a round cake, because the negative space and the platform below it mimic the shape of the cakes, creating a phantom layer. While leaving the sides of a square cake plain is a great way to create an elegant cake, sometimes the opposite effect is just as powerful. This square cake has been decorated with a basketweave design that adds depth and dimension. Make your cake a part of the scenery by starting with a square cake set on a square table. Then drap a swag of fondant down the side of the cake, mimicing the swags of tulle and cloth nearby. The flowing swags and the straight lines of the cake make a lovely contrast as well. Create contrast by using round decorations on a square cake. The golden, textured square cakes make the perfect foil and showcase for the smooth, round ring topper. The small circular dots surrounding the bottom of each layer add to the contrasting design. No matter what design you choose, your idea for a square wedding cake is sure to make it the center of attention at your wedding reception.